Now, I’m more patient with my natural hair growth. Yet, this hasn’t always been true. I tended to snip my strands when I didn’t see quick results…I know…very unproductive. Yet after two years of hair growth without heated styling, I now understand if I keep three things in mind, I can survive three more years, get to my hair length goal and still have more than a stitch of sanity left. 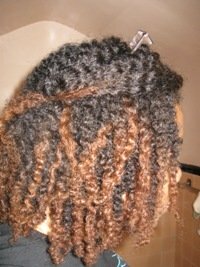 While my hair I can honestly say is longer now, day by day the length still seems to change obviously due to shrinkage. It especially got the best of me during the winter of 2009. My hair was just not very cooperative. It never has been. The shrinkage even made me second guess my pictures. I’ve actually thought on occasion that my hair fell out while I wasn’t looking. But that’s the sneakiness of shrinkage. It will make you think hair growth isn’t happening. That’s why you always need that handy dandy photo from last month and a current hair growth shot to prove you’re wrong. I noticed that my hair is grossly uneven. At first I used to think that I had to cut it to make it all even and blunt so it looked neat. Yet then after I cut it, the unevenness would return. Now I’m not talking a difference of a ½ of an inch. I’m talking about 1-2 inches of difference in hair growth across strands that are sitting right next to each other. This created unrealistic expectations especially when I used to straighten my hair. In 2008 I cut my hair twice to increase the thickness and address my uneven hair. However, it didn’t matter because, my hair grew how it wanted to…wickedly uneven. But that’s the reality. All of your follicles are never all in the same growth phase. So while one may be two years old, another hair on your head may be four years old and another may be a newborn. That’s hair. All of it will not be doing the same thing at the same time. Understanding this fact equips you with the knowledge of what your hair does. And if you know this information you will judge your hair by realistic standards. For me, I leave my hair to its own devices and just snip for split ends and knots, but no major trims at all. One day it will all reach the same length according to its own growth pattern. The typical growth pattern for yearly hair growth is six inches and a ½ inch a month. Well…that’s not for me. My hair grows 3-4 inches a year tops. I know this because the year I colored my hair, I waited a year for my roots to grow out. When I measured my natural hair color, I measured 3-4 inches. The length was not consistent across my entire head either. In some places it was 4 inches and in others it was 3-4 inches. I think this also contributed to my anger with my hair. I felt that if my hair didn’t grow the six inches a year that I thought to be true for everyone’s hair, it wasn’t growing,. Yet in reality, my hair grew four inches a year and I should have been going by that standard instead. Leave other's expectations at the door. Learning these tips doesn’t put unrealistic expectations on your hair. Because when that happens, then you will start fighting with your follicles which only leads to hair cuts (sometimes self-inflicted). So I will wait and stay the course. Three more years and counting. Read what I learned about natural hair growth last year.